Why I Edit My Christmas Decorations! 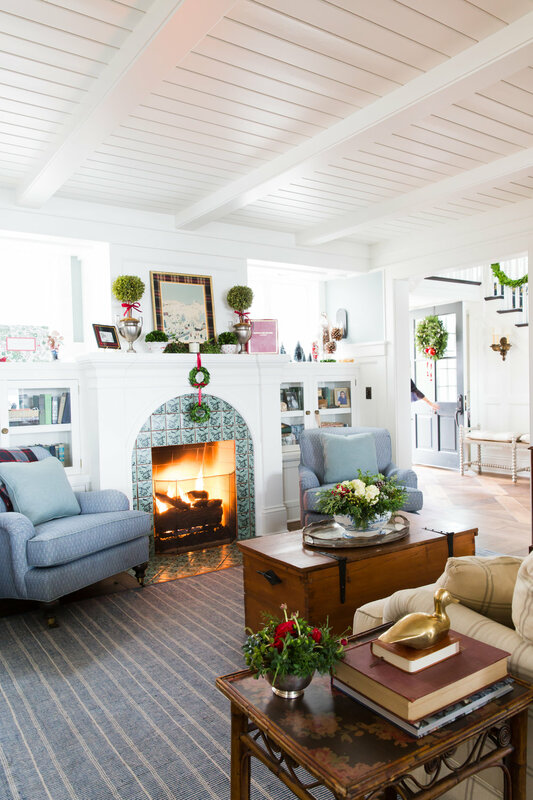 This preserved boxwood garland was an end of season purchase from Ballard Design. 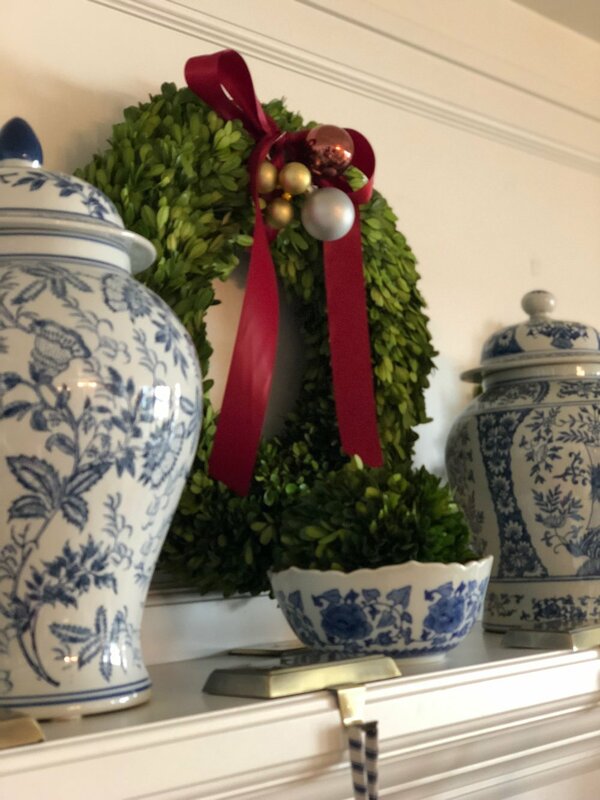 At the time, I didn't want to buy anything Christmas related (as I had just taken it all down and put it far far away,) but I couldn't pass up this classic garland at 60% off! One of the BEST decisions I've made! The gold balls are a HomeGoods find! The lovely pillows are from Gray Home and the plaid is the same as the one used in The Vignette Box! I had to have it!! Every year, I cannot wait to get out all of my decorations and then I lug them up from the basement and have a mini breakdown that nothing is going to work. Good times! Truth is, once the dusty plastic bins take over my main floor, I panic! I feel like I'm embarking on a country Christmas adventure. Anybody else ever feel like that? Thankfully, and I truly mean–THANKFULLY– every little item new or old after a few hours, seems to take shape and find the perfect home. The staircase is one of my favorite places to decorate. 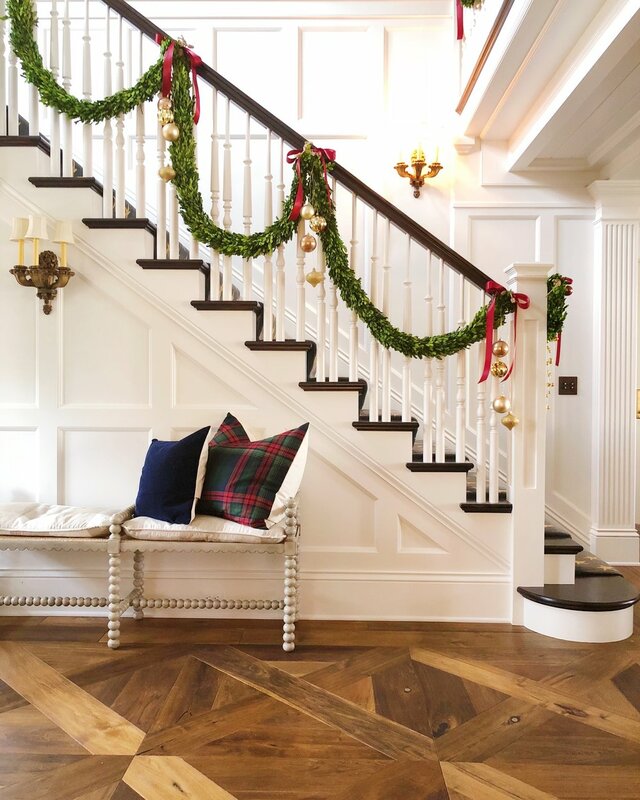 I love, LOVE the "Sound Of Music" vibe that garland on a sweeping staircase induces. So much that it makes me hum, "these are a few of my favorite things" all the day long. The bows, the balls–the swooping boxwood garland. It all just makes me so happy. My decorations are a lot of yesterday and a little bit of today. Each Christmas, I tend to edit what stays, goes and gets put in the "special box" because some items are just too precious to part with, but not quite what I'm feeling in the moment. A lot of people (and I admire you all,) use the same decorations in the same spot–so every year there is no breakdown like the one I encounter while standing in my living room surrounded by said dusty bins that are overflowing with red (a color I'm not usually drawn to.) My husband knows me well enough to go find something else to do, while I tinker around, one wreath and santa at a time. Bless his heart. I started with the tree. It's fake! WHAT?? You did a fake tree? Yes! I did. Partly because I had to (we had a photo shoot for The Vignette Box Christmas Edition in November and trees weren't available) and secretly, because I've always wanted one. This one is so freaking fabulous that my kids don't even know it's not real. Thank you Balsam Hill for building such a lovely tree and making it so easy to set up. You saved me and my husband from a bickering session in the tree lot while a nice young cub scout holds a very heavy tree in the freezing cold. I mean look at it! Isn't it wonderful? After the tree was (easily) set up, I moved to the mantle. I took down my art and made a clear space to decorate. Panic set in–like it always does. How will I make this work? But I took a breath and moved forward. I started with these three preserved boxwood wreaths. Funny thing–every year I say, I am not going to clutter up the place with Christmas. Keep it clean and simple, I tell myself. And I think I did it this year! I loved the simple wreaths against the wood, but decided the mantle needed a little more punch. Both work, but one made me happier. So I added my blue and white ginger jars to jazz it up. I love the new look. Still simple, nothing new, just things I owned used in a new way. Win Win! What I'm loving this year is everything seems new, because I did edit what I wanted to showcase. I didn't just use it because I always do. Nope, this year I made a conscious decision to keep things simple– but cheery, classic and comforting. The front entry is such a fun place to be playful. 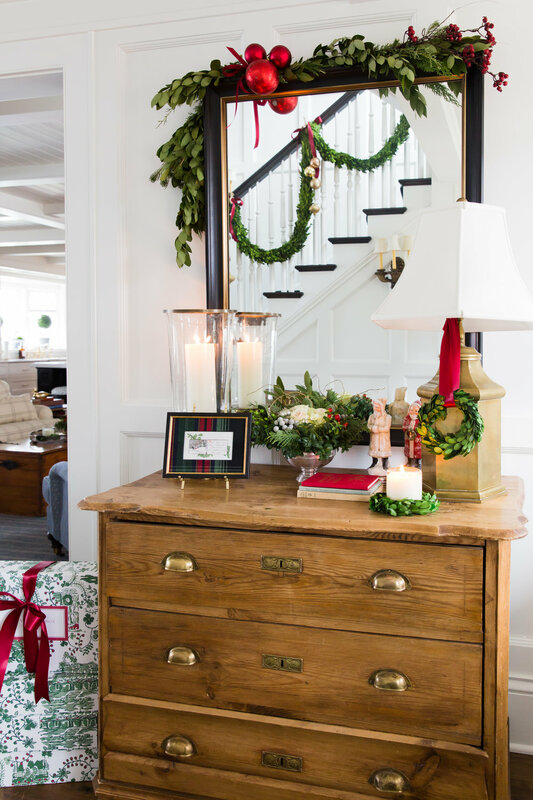 This shot is from The Vignette Box photo shoot and I love how the Ralph Lauren plaid framed Christmas greeting adds a touch of classic and the black and gold frame is a standout. The mini preserved boxwoods that come in each box can be hung with the accompanied ribbon or place the yummy candle inside. The nook. It's so cozy. This is another shot from The Vignette Box photo shoot where we showcase some of the treasures inside the box and share how they can make any room special. I just want to say this out loud...At the end of this season, I am committed to organizing my Christmas decorations like Nate Berkus does. I even bought a label maker! Maybe next year, I won't have to pull everything out!! Truth corner, in years past, after Christmas was over and the old "real" tree was dead, I couldn't wait to get rid of Christmas in my house. So, I'd end up just shoving everything back in the unorganized bins and deal with them all "next year." Well, not this year my friends! Not happening! Nate Berkus...You have my word!! Cleary, I'm obsessed with making my house special for the Holidays, but really, I am deeply humbled to be able to decorate with a passion that my kids and family so appreciate. So "these are a few of my favorite things," will continue to be hummed through the rooms of Sweet Shady Lane while I tinker and play and make everything just right for the ones that I love dearly. The Vignette Box Christmas Edition makes the perfect gift for yourself or a friend. It can be a starter vignette or an addition to a vignette you have already created. It's wonderful and currently available for a limited time. Use code JOLLY10 to receive 10% off. YAY!!!! Some photos by the amazing Ashley Sullivan and some by little ol' me. How I Built My BEST Year ever!